There are several factors at play when it comes to attracting mosquitoes. In terms of feeding, they choose their victims by the scent of their sweat and released carbon dioxide. Mosquitoes are also very attracted to heat. People with higher body temperatures may find themselves surrounded by these flying pests more than others. This fact also goes some way toward explaining why they prefer certain light sources over others. This question can be answered with a very short 'yes'. Mosquitoes, along with many other flying insects, find certain lights irresistible, and they will travel some distance to reach something if they believe it to be in their interest. Mosquitoes are positive phototaxis insects, which means simply that light attracts them. Some other bugs, such as cockroaches, are negative phototaxis, meaning they actively avoid light. There are several theories as to why positive phototaxis insects are so attracted to light. Some experts believe it is because the light source confuses the insects' navigation systems, making them fly straight into the bulb. Others think that flying insects like mosquitoes see the light as an easy and open path to fly by. Although, unfortunately for them, they usually end up getting roasted on the bulb. For those of us who want to dodge mosquitoes, the real question here is what kind of light do they prefer? Knowing this can help you decide which outdoor lights you should choose, and which to avoid. Science shows that mosquitoes are most attracted to UV lights that have a cool, blue tone. This is why most bug zapping devices use a blue-violet color. Which Lights Attract Mosquitoes the Most? Make sure the light bulbs you buy for your porch or terrace aren't mosquito magnets. This is key to creating to creating a bite-free evening atmosphere, as mosquitoes usually come out in the evening and into the night. Compact fluorescent bulbs (CFLs), attract the most flying insects. This bulb beams violet wavelengths, which is sure to make all mosquitoes rush towards it. Another mosquito favorite is the regular, incandescent light bulbs many of us use inside our homes. Older LED lights are also a mosquito preference because they emit a high amount of UV light. The number of mosquitoes entering the house will almost certainly be higher if light being emitted from these sources can be seen from outside. Is There a Light That Won’t Attract Mosquitoes? Yellow lights are the best thing to use in your outdoor areas to keep mosquitoes away. Because they emit less UV, flying insects don't find them as attractive as other light sources. Newer, LED light bulbs are being created with reduced UV and blue light levels. This should make them much less of a mosquito magnet. There are also special bug lights available on the market, which the makers claim will attract 20 percent fewer bugs. If you prefer to use LED lights for your outdoor areas, make sure you choose yellow LED lights instead of blue-toned ones. What Other Things Are Mosquitoes Attracted To? There are many things that can make you a mosquito magnet. Some of these factors we can change, and others we have no control over. You may not believe me when I say this, but mosquitoes are surprisingly picky eaters, especially when it comes to humans. One thing attracting mosquitoes which we can't prevent is our blood type. People with blood Type O are much more appetizing to mosquitoes than, for example, people with Type A blood. This is because those with Type O blood emit a different scent which mosquitoes prefer. Mosquitoes love certain types of human body odor. Bacteria, combined with just the right amount of sweat, creates the tastiest meal - if you're a mosquito that is. Our sweat wouldn't have any odor without the bacteria on our bodies. Unfortunately, it is the malaria-carrying mosquito that is most attracted to human sweat. Taking regular showers can reduce the odor we give off. However, don't think you can become mosquito-free by covering yourself in perfume. It has been shown that different scents, including perfumes, may entice different mosquitoes. Lactic acid is secreted through our skin when we eat certain foods or via exercising. The more lactic acid you're emitting, the more mosquitoes will love you.Washing thoroughly after exercising can reduce the amount of lactic acid found on your skin. One of the biggest things that attract mosquitoes to humans is the carbon dioxide we exhale. The scent, and the amount released play a big role when it comes to which person the mosquito will choose. We release a significant amount of chemicals when we exhale. These are lactic, uric, and fatty acids, along with octanol and CO2. These chemicals create the perfect cocktail for mosquitoes. A mosquito can smell a human from far away, whether they choose you or not depends on your scent. Also, people who emit more CO2 are much easier for mosquitoes to find. Larger people will exhale a greater amount of CO2 than smaller people. This can explain why adults are generally bitten more than children. Pregnant women might also find themselves surrounded by mosquitoes wherever they go. They exhale a much greater amount of carbon dioxide, compared to others. 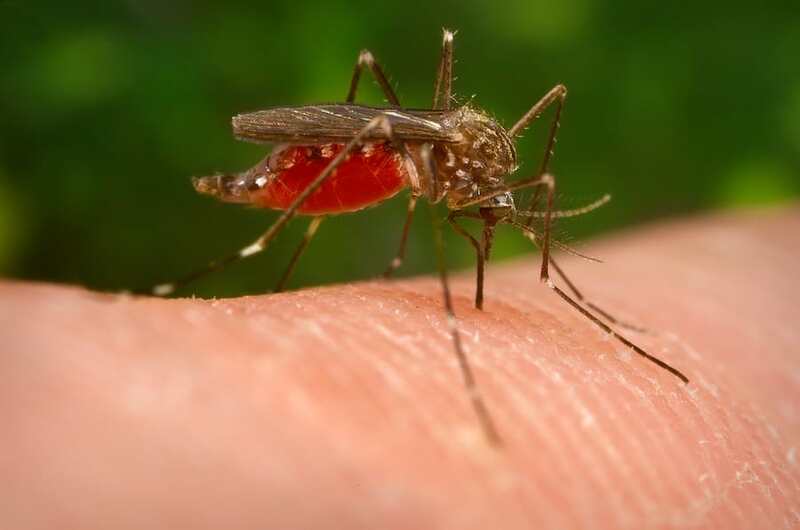 Another reason why mosquitoes love pregnant women is because of their raised body temperature and increased blood flow. If you enjoy a cold beer or a glass of red wine in the early evening, you might just find yourself with a few unwanted guests. Research suggests that mosquitoes find people who drink alcohol more attractive. This is due to their body temperature being higher. Mosquitoes are positive phototaxis insects, meaning they love light. All types of light will attract these flying bugs at night. There are, however, certain types of light they prefer over others. Any bulb with a strong UV light will attract more mosquitoes, particularly if it is a blue light. Knowing which lights to avoid can help to make your porch mosquito-free. Using less unnecessary lighting outside at night can also help to get rid of fleas in the yard. There are many other factors which attract mosquitoes to humans, the carbon dioxide which we exhale plays a huge role in this. The best thing to do is stay protected by wearing suitable clothing and choosing an effective repellent.